One of my favourite typewriters to write with is the Smith-Corona 5TE. I like to think of it as my "Clayton's typewriter". It's "the electric typewriter you're using when you're not using an electric typewriter" - if that makes any sense. Years ago a non-alcoholic drink called Clayton's was promoted in Australia as "the drink you're having when you're not having a drink". To all intents and purposes, you might seem to be sitting at a bar drinking Scotch, yet completely safe from the breathalyzer and the risk of a drink-driving conviction. It caught on. With the 5TE, I feel comfortable that I won't be drummed out of the Typosphere. My point is that the 5TE isn't, strictly speaking, an electric typewriter, at least not an electric typewriter as we came to know them 12 years later, with a powered carriage return and turn of the platen. 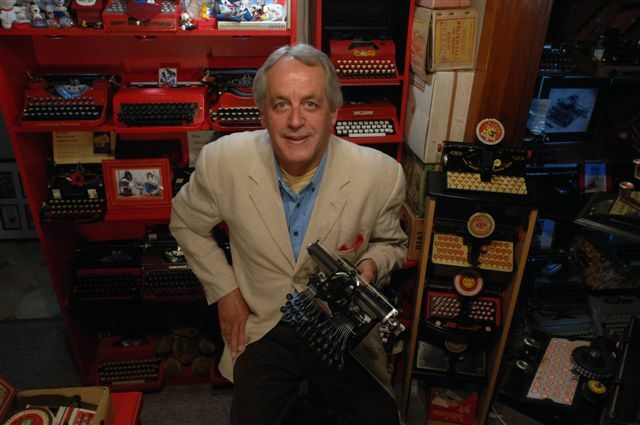 (I bought my first true Smith-Corona electric in 1969.) All that's powered on the 5TE is the keyboard. Otherwise it's just a Smith-Corona Series 5 portable typewriter. So it presents the best of both worlds, in my book - swift, even printing, but with what is ostensibly a manual typewriter. Now I think I've found a manual portable typewriter that types like an electric - that is, as in a 5TE electric. I realise this sounds rather far-fetched, but when I began typing on this Hispano Olivetti Pluma 22 last night, I really thought I was getting the same light, rapid typebar movement as the 5TE, with the same resulting evenness of print. The keys had a really taut feel about them, and yet the action was as light as a feather. I slept on this thought overnight, got up and tried the Pluma 22 again this morning, and got exactly the same impression. It's truly remarkable. Should I now dub the Pluma "the manual you're using when you think you're using an electric"? I add my Torpedo 18 to that category. what a nice typeface too! Beautiful typewriter. If the action is as light as a feather, that's most appropriate, since "pluma" means feather. It's interesting that it apparently does not feel like Lettera 22's made elsewhere. What a strange machine! But, since it so resembles an electric Lettera, kind of alluring, in a way. Still not sold on the non-alcoholic scotch, though. I'm baffled here. Is there any actual mechanical-functional differences between the Pluma 22 and the Lettera 22? Or it's just a case of different badgings for different countries? In Mexico we never saw the Pluma name; the machines were all known as Lettera (even the Dora was marketed as a Lettera S). But apparently in South America they indeed were known as Pluma 22. I find Lettera 22's to be all over the place as far as typing action is concerned. I've typed on a couple that were as dead-feeling as the Everest is said to be, a couple that were absolutely dreamy and electric-like in touch, and several that were better than average. Thank you Florian, Peter, Richard, Mike, Miguel and Ted. These are all very interesting comments. As well as this Pluma, I have also been working on a Sears Courier, made for Olivetti in Mexico. There are minor yet noticeable differences from the Ivrea and Glasgow-built 22s, which are identical. I have no idea whether a different serial numbering system operated in Barcelona, but the marked segment, slightly displaced rubber sleeve on the platen and the gold rather than silver brushed metal on each end of the carriage indicate this Pluma is older than other 22s I have used. Because of its age, I found I had to replace the grommets and thereby tighten the frame to the base, which might account for the taut feel. But the light touch and even print I find very unusual. All models differ from machine to machine, of course, but you'd have to wonder why one stands out so much from others in the line. One very noticeable thing is that as the Lettera advanced into the 32, the design of the paper plate section, with paper supports and margin setters, went backwards but becoming more complicated. A difference on this (very early?) Pluma is that this section is so simple and straightforward that it's brilliant. This Pluma is certainly alluring.